The meeting in Stockholm took place from 3 to 6 May 2007. Here are some impressions, noted as as the meeting unfolded. Such generosity warmed the hearts of the pilgrims, mainly from Zagreb but also including 3 Serbs from Belgrade, who had left the Balkans at 1am to reach Stockholm early in the afternoon. A young man from Singapore and someone from Austria also arrived today, helping us realise that what at the outset had been planned as a Nordic meeting has in fact become something far larger. “Let us keep our doors open”, the main pastor of the parish said this evening, adding that there was no entry code needed to get into the parish buildings – not something very usual in today’s Stockholm…. With the May 1 holiday, the groups were later in finding the welcome centre than expected. At a certain moment, it looked as if the planned prayer would have to be set aside in order to get ready for tomorrow’s business of welcoming the main preparation group, but then we decided, no, we’re here to pray and not to organise. Explanations can wait until tomorrow. And so, in the chapel of Ersta, where the brothers have been praying each morning over the past three months, we gathered and sang in Swedish, with Bible readings in English and Croatian. No-one noticed us probably, but then that’s the yeast which will help the dough to rise over the next few days. Two groups from Gdansk have made the short journey across the Baltic Sea to join us in Stockholm. For all of them it was their first trip to Sweden. They are so used to travelling days and nights to take part in Taizé meetings – “It’s marvellous to have something close at hand!” All those who arrived today came in order to help with the practical work involved in the meeting, from helping to decorate Katarina Church, where the prayers will be held, to making the signs that will show the way to the different workshops. Others decided to sing in the choir. It looks like most of the singers will be non-Swedes even though we will be singing mainly in Swedish! 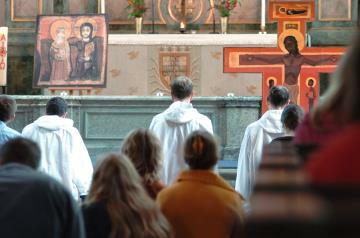 In the evening, the chapel of Ersta was packed with young people. A good number of people from Stockholm came to be with us. It feels like the meeting is already beginning…. 10pm. A call from Katarina Church. The decorations are almost complete. Two of us venture out into the dark of night. As we approach the vast domed building, the warm glowing light coming from inside enables us to anticipate the transformation that greets our eyes as we enter. A whole team has been working hard over the past two days. Carpets have been laid, coloured material hung from the walls, icons and plants placed in the choir. Several candle stands from different churches on Sadermalm have been placed behind the altar. There is a beautiful tradition in the Sweden of lighting candles after communion, or at the end of the service, and placing them as a prayer in such stands. When we pray in Katarina Church, all the different churches will be present with us in that way. Today it’s the turn of the Estonians, Latvians, Lithuanians, Finns, Danes, Norwegians and Swedes to arrive. From midday onwards, the parish house of Katarina parish was a hive of activity. 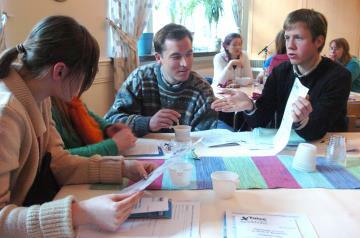 One of the most beautiful moments came when a young Swedish pastor came with his group. Three of them were Karens from Myanmar who had just recently arrived in Sweden. The group from Zagreb who arrived two days ago were very faithful in carrying out the tasks of welcoming – even the simple jobs made a difference, like guiding people from the underground station to the welcome centre. It’s not easy to find your way when you arrive in a new city! From the parish house, the young pilgrims are sent out to 14 different welcome centres throughout the city, usually based in a Church of Sweden parish, but sometimes in a Swedish Covenant Church parish. What is common to each centre is that several parishes are involved. All the participants will stay with families. In the parish of Kista, several immigrant families will open their doors to receive guests in a beautiful sign of Gospel hospitality. Final preparations in Katarina Church are made as the afternoon draws on for the first evening prayer altogether. The choir rehearses. Sound checks are made. The church team starts to give out song sheets as the people start to arrive for prayer. 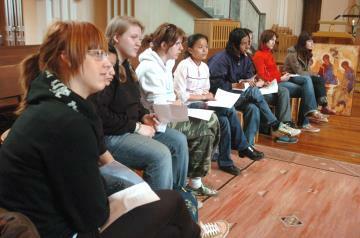 A short song practice is held to teach some songs. And then silence. 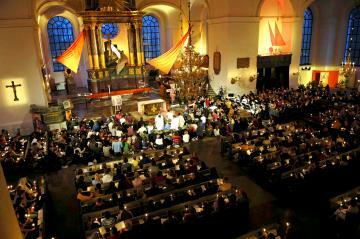 The church bells ring out and call us all to prayer, like for the start of all services in Sweden. Sjung lovsang, alla länder, och prisa Herrens namm! – Sing praises all you peoples, sing praises to the Lord! The rain forecast for the weekend seems to have headed elsewhere. A fine Swedish spring day accompanied the first morning of meetings in the 14 welcome centres throughout Stockholm. At Maria Magdalena church, young people from Germany, Austria, Ukraine, Finland, Norway and Sweden gathered for a time of prayer, with a Bible reading, intercessions, silence and songs. What was marvellous was to see that it was young people who were leading the prayer. The priest sat at the back, saying that she had encouraged them to prepare everything themselves. Two sets of workshops were programmed for the afternoon. One set began at 2.30pm after the 1pm prayer and the second at 5pm. A good number of people came to listen to a reflection led by one of the brothers on the theme: “God has chosen each one of us; how can we discover God’s call in our life?” The workshop on the theme of solidarity brought together a deacon working with the elderly, a priest with a special ministry with drug addicts in one of the central Stockholm parishes and a young woman from Estonia who works with AIDS sufferers in her country. One of the liveliest moments came when young people from Myanmar, Philippines, El Salvador and Iraq told of their faith through song and dance. There are so many immigrant communities in Stockholm. It was a joy to see them witnessing together to a common belief: so many different people, so many different experiences, so many people searching, so many people committing themselves in various ways. With the fragrance of hawthorn blossom and lilac strong in the air as we walked through the churchyard, evening prayer began in Katarina Church at 8pm. Even more than yesterday evening, there was a density in the prayer which could only come from the intense desire of those participating to seek God. The songs rang around the huge dome of the church. The time of silence was utterly still. 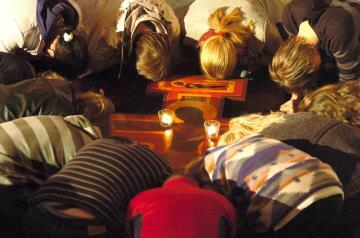 In his meditation, Brother Alois said: “I would like to say a few more words to the young people among you. Today it is above all you who are the ones able to communicate trust in God to those around you, doing it by the life you live as well as by a few words. Do not let doubts or the impression that you lack preparation or knowledge hold you back. All this is part of a life in the footsteps of Christ.” And as we gathered to pray around the cross, you could sense something of longing of so many people to take another step in their following of Christ. In Immanuelskyrkan, the Swedish Covenant Church in the centre of the city, each morning, young pilgrims visited Ny Gemenskap, a community of lay people which offers a welcome to those living on the streets. They are not only Swedish. There are often people from other immigrant communities. This kind of hospitality is a real sign of hope. Perhaps visits such as these could encourage others to undertake similar initiatives in their own towns when they get home. Choosing to love, choosing hope is never easy, but requires an active decision on our side. But when that choice is made, we can so often be astonished at the fullness of life we discover. 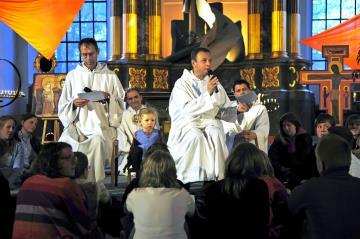 It is difficult to find words for the final evening prayer together in Katarina Church. To see this church full and to hear the sheer beauty of the singing was like a prophetic glimpse of what is to come – a springtime experience, in every way that can be understood. The presence of the Bishop of Stockholm, together with the District Superintendent of the Swedish Covenant Church and representatives of the Catholic bishop, not forgetting Baptists and Free Church members in the congregation, expressed how the meeting was supported by all the Christian communities in the city. But it was above all the presence of so many young people who had come freely and of their own choice to participate in the prayer that was the most striking. In the context of Sweden this is no small thing. And the power of intercession... the Kyries rang out as we prayed for peace in Iraq, for reconciliation in Estonia. A group of Iraqi Christians read the Gospel in Aramaic, the language of Jesus: "I no longer call you servants, but friends..." Brother Alois handed on the “icon of friendship” - given to the young people of Sweden during the meeting in Zagreb - to the group from Linköping. It will continue its pilgrimage and in the coming weeks it will be the focus for prayer for young adults in the city. The journey continues. We are all pilgrims seeking to love, seeking hope. The last day of our meeting. This morning, everyone was out in their host parishes for the Sunday worship. In Kista, the Eritreans led the intercessions. What a testimony of devotion and belief in the power of prayer! With great fervour and hands raised, they prayed for twenty minutes. The signs of the universality of our faith have been multiple during these days. I have to confess that there’s always a slight tinge of regret when these meetings draw to a close. You wish they could go on at least a few more days! And especially because of the warmth of the welcome here in Stockholm and a real sense of seeds being planted in the lives of the young Christians here, you’d like to stay around, help them grow and continue supporting and encouraging each other. Like Peter, we’d like to build tents and remain in this radiant light where everything seems so clear. But Peter heard the voice saying “This is my Son, the beloved, listen to him.” And when he looked again, he saw only Jesus. Together they descended from the hill and began the journey towards Jerusalem. The sign of the icon of friendship being given by Br Alois to the young people from Linköping, shows us that the Pilgrimage of Trust will continue throughout Sweden without the brothers. In a few weeks, they’ll meet for prayer in that town and from there the icon will continue its journey. This is so important. Church life here can often be so professional and well organised. Young people can open paths of trust if you let them take the initiative. That’s what this meeting has been about. The heavens have opened and it’s pouring down! This morning, we were a handful gathered at Ersta for morning prayer. Once again our worship has become invisible. A humble sign in the midst of the city. Who knows what that prayer will bring, but it is offered simply as a response to a Love. And it will continue here in Stockholm. On Sunday May 13 at 4pm, we’ll gather a final time in Katarina Church. Hopefully many of the families and young people from the different parishes of the city and surroundings will come for one final act of thanksgiving before the brothers return to Taizé. In Katarina Church, they were so happy with the decorations made for the meeting that they’ve decided to keep them for another week! So the orange sails and lighting, the claret and amber flowers and icons will all stay in place. What a beautiful space for prayer this church has been. We are so grateful for the welcome received.